The Miles Sound System offers a versatile, powerful toolset for game audio. With our powerful content creation and manager, the Miles Studio, audio development is hands-off from the engineer perspective, allowing the audio team to work independently and fast - while also freeing up engineering time. The best way to get a sense of the depth and breadth that Miles Studio provides is to check out this summary of its key areas of functionality. If you have any questions, you can always email us or call us at 425.893.4300. In Miles Studio, it's as easy as dragging and dropping to get audio imported, and a few clicks later an event can be created to play it. While connected to the game, one more click gets everything sent over the network, allowing you to experience the cue in situ. Editing features such as copy and paste, a full undo stack, and templates for complex content allow for rapid content creating and iteration. 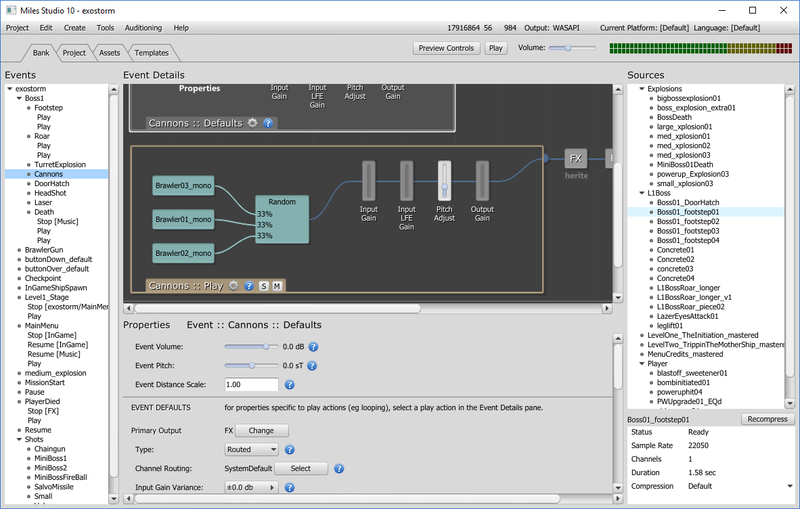 If not connected to the game, events can be previewed in Miles Studio with complete control of game provided parameters. 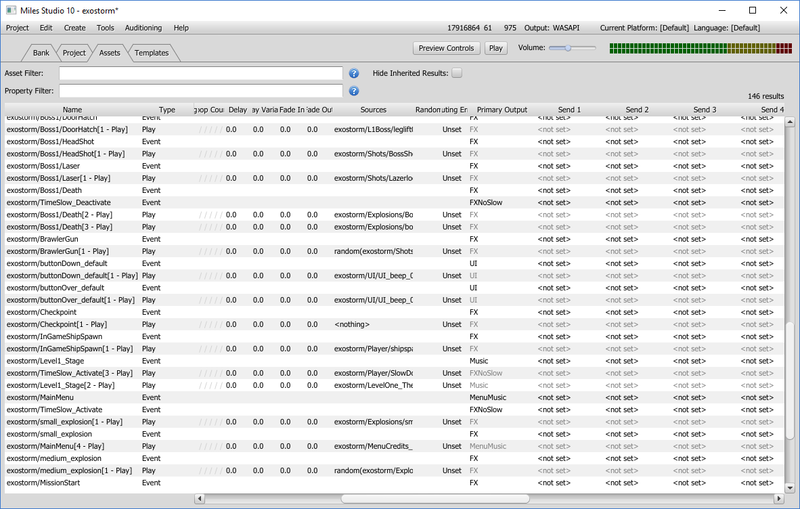 The Assets view in Miles Studio allows robust searching of assets (e.g. 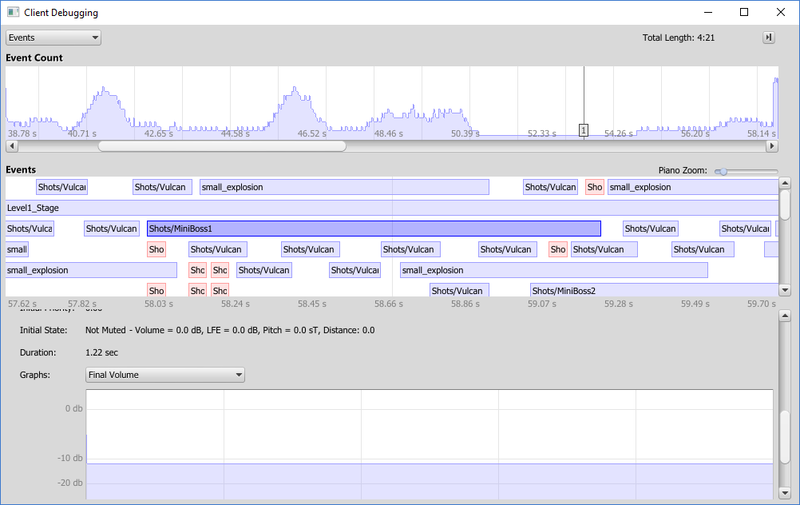 play actions outputing to fx bus). Once a subset of the assets is found, copy and paste allows for setting the property for any number of assets to the same value ('broadcasting' the value) - or edit values individually using context-sensitive editing. Miles Studio supports any number of buses, allowing fine-grained management of volumes and voices. Buses are the primary tool for managing voice counts as well, providing a hierarchical maximum counts with bus-specific ranking systems, ensuring only the voices you want to hear are heard, saving precious performance and listening environment complexity. Controllers are the linkage between Miles Studio and the game itself, exposing parameters for use by sound events and buses. These values can be transformed and/or combined in to new values using either a graph based system or raw math formulas, with each point-of-use using a different transform. 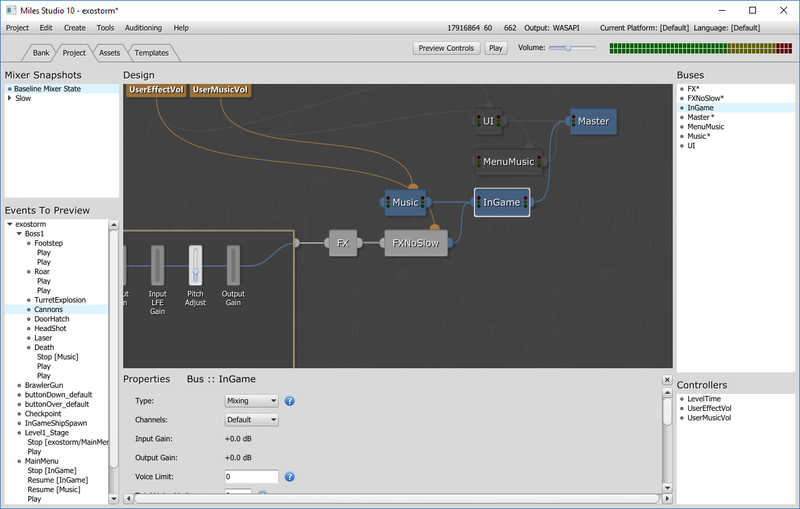 This is a super powerful system, allowing technical sound designers to provide single values integrating many different parameters from the game. Filters are integrated with Miles Studio, allowing parameters to be driver by any controller (including which impulse to use for convolution reverb!). The following filters are provided: Delay, Compressor, Gate, ParametricEQ, GainBlock (distortion), Flanger, Chorus, Highpass, Lowpass, Bandpass, Algorithmic Reverb (Schroeder), and Convolution Reverb. The convolution reverb impulse responses are set by the project and can be set to any IR you want! While connected to your game, Miles Studio captures all kinds of data, allowing designers to see exactly why things went wrong or why they sounded the way they did. 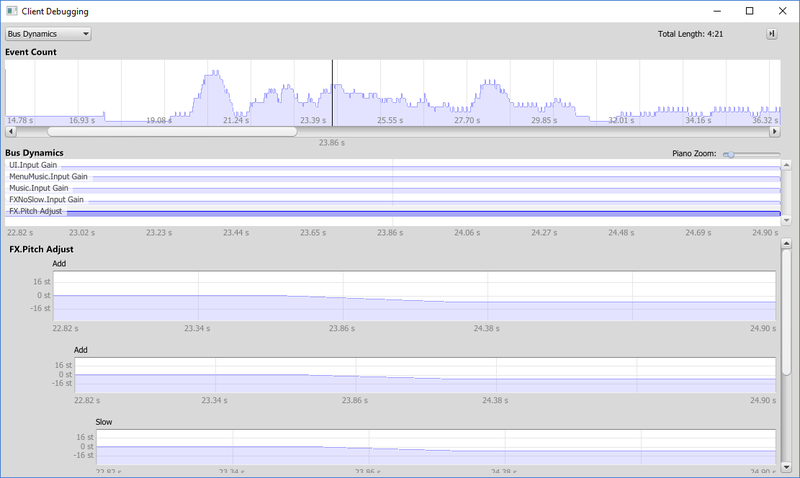 This data includes bus volume levels, global and per-event controller values, events, missing events, started voices, evicted voices, data loaders, starvations, CPU usage, sound memory usage, duck on/off state, voice volume levels, and more.